Located on a quiet, tree-lined street in suburban Fenton, the townhouse will easily become your relaxing home-away-from home. Everything has been updated with a traveler's comfort in mind. On the first floor is a comfortable living room with cable TV, 1/2 bath, and a open, sunny kitchen and dining area. The kitchen has been stocked with plenty of pots, pans, dishes, utensils, napkins, etc. to make cooking and eating in a breeze. A Keurig coffee maker and a selection of caffeinated and decaf coffees are provided. You are also welcome to use the washing machine, dryer, iron and laundry supplies located in a closet at the end of the dining room. 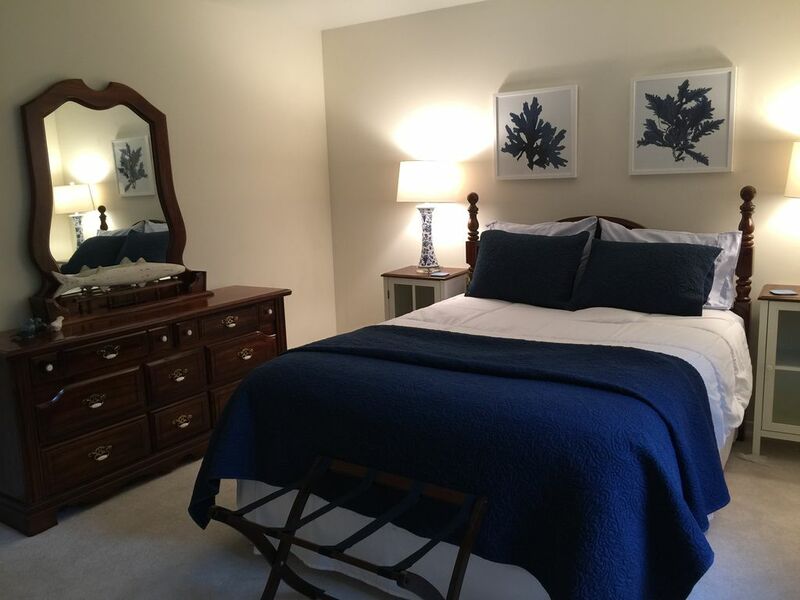 Two large bedrooms are located upstairs and both have been outfitted with all new bedding and decor. There's a subtle beach cottage vibe running through the house. The master bedroom features a queen size bed and the second bedroom features two XXL single beds. These are custom-sized beds that are longer and wider than a standard twin; they are actually half way between a twin and a full and are perfectly comfortable for a large adult. Also upstairs is a full bath with excellent water pressure, plush towels, and basic essentials including soap, shampoo, toothpaste and a first aid kit. Also included is full use of the single car garage. The neighborhood is very peaceful and quiet. About 1/2 a block away is Riverside Golf Course and just 2 blocks away is the Fenton City Park, which offers a playground, 1.5 mile walking/running path, basketball courts, and soccer & baseball fields. Accessing area attractions is quick and easy, as the townhouse is located just a few minutes from the intersection of Highways 270 and 44. Highway 44 is widely considered the least congested artery into St. Louis, with Forest Park, the St. Louis Zoo, the Missouri Botanical Garden, the Science Center and many other attractions are just 15 minutes to the east. Downtown, Busch Stadium and the Gateway Arch are just 5 minutes further along. And to the west about 20 min is Six Flags Over Mid-America, the area's major amusement park. St. Louis has a wealth of activities with something for everyone, and just about anything you'd want to do is only a short drive away. Soccer enthusiasts, the St. Louis Soccer Park is only 4 minutes away! I would love to host you during your stay! Riverchase Recreation Center is also just a few minutes away.. This modern facility features the latest exercise equipment, an indoor track, basketball courts, and best of all one indoor and two outdoor pools. In summer it is the best pool in the entire metro area with kiddie fountains, a lazy river, diving boards, and lap lanes. Unlike most area pools and gyms, you do not need to be a member or a resident to enter. Groceries are easy to access from the townhouse, with both Dierberg's and Walmart grocery stores just 8 minutes away. Dierberg's is a locally-owned chain of higher-end grocery stores with everything youcy are likely to want, including a good selection of organic and natural foods. A variety of up-scale and/or ethnic restaurants are also 10 minutes away in Kirkwood. Some of my favorites are Sunset 44 for an elegant dinner, Citizen Kane's for succulent steaks in a refined victorian house, Dewey's Pizza and Pi Pizzeria, One 1cyuby for tapas, Sushi Bistro, Amigos Cantina, and First Watch for delicious, healthful breakfasts & lunches. Peppe's Apt 2 is next on my list to try as reviewers call it a hidden gem! Lastly, whether you were born to shop or just suddenly need a few things, the possibilities in Fenton are nearly endless. Gravois Bluffs shopping center has Target, Lowe's, Sports Authority, Pier 1 and dozens more, along with many affordable restaurants and a movie theater. If you prefer Macy's or Nordstrom's, West County Mall is just 10 minutes north on Hwy 270. I'm young at heart and a lifelong learner. I've traveled quite a bit, especially in Latin America, and am fluent in Spanish. I enjoy spending time with family and friends, swim laps a few times a week, and enjoy the outdoors. My daydreams of late center on moving to a warmer locale! One space in garage. One space in driveway. Also additional street parking if needed. In addition, great walking paths and parks just a few blocks away. Home was payed out nice with nice furniture. Beds were very comfortable. Great overall stay. Perfect, clean and close to everything! The townhome was in a pretty area near a river and park with great walking paths. We loved how quiet it was at night. No street traffic or any other noises. This place is very well kept and clean! The house is located close to the highway and is a great central place to get to everything. The owner, Diane, is very sweet and responds quickly. She was quick to help us when we had to make a last minute adjustment to our reservation due to being evacuated for a hurricane. We will be staying here again every time we come back! Good experience, property was exactly as described, we would stay here again. There is plenty of space for my wife, our two boys, and myself. The fully equipped kitchen allowed us to save money by preparing our own meals instead of eating out all the time. Diane even provides an electric grill that worked perfectly to grill some steaks. It is immaculately clean with plenty of towels and toiletries. The townhome is perfectly located in a quiet neighborhood. Everything we wanted to do was within 30 minutes from the place and most were 20 minutes away; the Zoo, the Muny, the Planetarium, the City Museum, the Missouri State History Museum, Ted Drew’s, a water park. Our entire trip right there! Diane is a pleasure to work with and communicates promptly. Thank you Diane! Great location, quiet neighborhood, close to everything . I loved staying here and would definitely want to return. It feels safe, comfortable and plenty of space. Easy to get on highway to anything and loved the walking trails on the golf course and along the Meremac River. Coffee available and candy was a fun treat. Thank you to Diane.